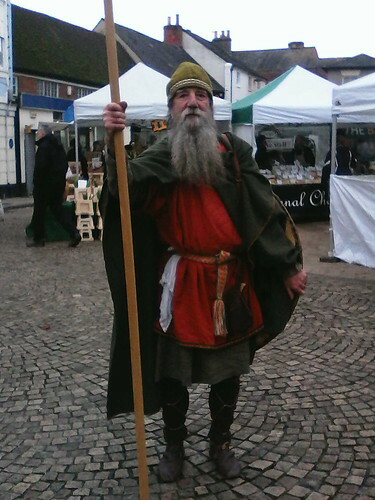 I encountered this person striking Anglo-Saxon attitudes in Romsey market place this morning. He cheerfully gave me permission to take his photograph, and seeing my quizzical look explained the reason for his get-up, namely the Anglo-Saxon Family Fun Day taking place at King John's house. We were getting on quite well, but then he had to spoil it by adding, "You might like to come along, if you've got children or, er, grandchildren." Now, it's true that someone of 54 may very well have grandchildren, and in fact I know several people younger than me who actually do, but this is the first time someone's put it to me quite so bluntly. Even muffled against the cold, surely my youthful mien shines through? Apparently not. When I told my mother about it a little later, she cackled gleefully - like the wizened old crone she is. Hah! I was asked by someone when I pushed my daughter around in her stroller if that was my grandkid. I was thirty! And yet, my grandmother dined out for years on the fact that the night I was born (it was blistering hot, of course) she stopped into a bar for a beer, and got carded. She was 36. That's a story worth dining out on! I assure you that "old enough to have grandchildren" is far from a thought I'd have when gazing upon you. But you can't tell what people will think. Opposite from sartorais's story, my grandmother, who was a full 58 years older than I, was once addressed by a taxi driver as my mother. I was 15, she was 73. And when I visited my father in his last days in a nursing home--he had Alzheimer's and was 80, I was 47, I was often asked if I was visiting my husband. That's another matter. Trophy wives? :-) When my mother was in hospital some years ago, my brother came to visit her and Mum overheard a nurse mutter, "Cradlesnatcher!" I asked her if she had responded. "No," Mum said. "I thought if she could believe I was able to get a young man to go to bed with me, fine." During that same time in hospital, she encountered an old gent in his righties who told my sixty-five year old mother, "Sixty-five? You're a baby!" These things are certainly relative. I've already notice that "old" is a movable feast in my mind, always keeping at least twenty years ahead of where I happen to be. I think I might be able to cope with being offered a seat! I have to giggle at this. People constantly mistake my age, and in the most inappropriate ways. My cousin (one year younger than I) just became a grandparent. If my Queenager has reproduced I'll kill 'er! Yes, it was a bit of a shock to realize that I had achieved a *reasonable* age to be a grandparent, rather than it only being possible with a couple of teen pregnancies in a row. But I was the only one in my family to get married under thirty, and didn't have children until 31 and 35, so 62 to 70+ seems far more reasonable. For now, anyway. I'm sure it won't when I get there.